You were brought to the hospital with injury or fractures to the bones in your spinal cord. Doctors after thorough evaluation advised you to go for a spinal fusion surgery to cure the problem. Spinal fusion is a surgery to permanently join together two or more bones in the spine so there is no movement between them. These bones are called vertebrae. - Spondylolisthesis, a condition in which one vertebra slips over the other. - Abnormal curvatures, such as those from scoliosis or kyphosis. You have undergone spinal fusion surgery when you were in the hospital. In lower back or lumbar spine, spinal fusion is commonly done following adequate decompression procedure like laminectomy, facetectomy etc in order to prevent instability of the spinal column. This helps prevent the damaged vertebrae from irritating or compressing nearby nerves, reducing the symptoms of pain. The additional section of bone can be taken from somewhere else in your body (usually the hip) or from a donor. Usually metallic implants in the form of screw, rods and cages are used to stabilise the spinal segments which are decompressed. These implants play an important role in maintaining the stability of the spine which helps in good fusion later. Fig.1. 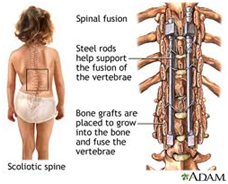 Spinal Fusion to treat scoliotic spine. - Continue to take your medications as ordered, especially the full course of antibiotics. - Try moving your limbs actively when you are in the bed right immediately after the surgery as this will help prevent from lot of dreaded complications such as DVT, embolism and chest infection. Your doctor may encourage you to turn towards your left or right soon after the surgery and you may be made to sit if necessary. - Avoid activities that strain the spine such as sitting or standing for too long, flexing your spine, bending at the waist, climbing too many stairs or going for long trips in the car. - Sleep on a firm mattress. - Continue with any exercises you were shown in hospital. Gradually increase them, although if you develop pain, stop the activity. - Beware of lifting, bending or twisting. - Be guided by your physiotherapist and doctor as to what specific activities you can and can't do, including walking and driving. - Report any signs of infection to your doctor, such as wound redness or seeping, elevated temperature or persistent headaches. - Infection in the wound or vertebral bones. It is common to get mild fever following surgery which will subside in few days. Report to your doctor if you have high grade fever with progressively increasing back pain which may indicate infection. - Doctor will usually advice you to be ambulant as soon as possible; the patient should try to be ambulant although they may have some back pain while getting up or while standing as early ambulation prevents dreaded complications like Deep Vein Thrombosis (DVT), embolism and chest infection. Recovery after fusion surgery is longer. You will not be able to return to activities as quickly. It takes at least 3 to 4 months after surgery for bones to heal well, and healing may continue to happen for at least a year. Mild back pain may persist for few weeks. As the tissues heal the pain will subside; do not panic. However be guided by your doctor and your physiotherapist and try to be ambulant under guidance based on your neurological status (strength in limbs). If you had spinal fusion, you will probably be off work for 4 to 6 weeks if you are young and healthy and your job is not very strenuous. It may take 4 to 6 months for older patients with more extensive surgery to get back to work. - Your back pain begins to worsen and does not get better with rest and pain medicines. - You are having difficulty urinating and controlling your bowel movements. - You should wear the brace when you are sitting or walking. - You may void wearing the brace when you sit on the side of the bed for a short period of time or use the bathroom at night. Avoid weight gain as it puts more burdens on the spine. Do not bend at the waist. Instead, bend your knees and squat down to pick up something. Do not lift or carry anything heavy. This means you should not lift a laundry basket, grocery bags, or small children. You should also avoid lifting something above your head until your fusion heals. Take only short walks for the first 2 weeks after surgery. - After that, you may slowly increase how far you walk. - You may go up or down stairs once a day for the first 1 or 2 weeks, if it does not cause much pain or discomfort. - Do not start swimming, golfing, running, or other more strenuous activities until you see your doctor. You should also avoid vacuuming and more strenuous household cleaning. You will also learn certain exercises that help make muscles in your back stronger, and keep your back safe and stable. Your doctor and physical therapist can help you decide whether or when you can return to your previous job. - Do not drive for the first 2 weeks after surgery. After 2 weeks, you may take short trips when necessary. - Travel only for short distances as a passenger in a car. Avoid trips where you are sitting for a long period of time. If you have a long ride home from the hospital, stop every 30 to 45 minutes to briefly stretch.